Beetle larvae develop at the second stage of a beetle's life cycle. The phase is an essential part of the beetle's growth as it allows for the insect to feed and store energy before it begins its pupal (cocoon) stage. Identifying beetle larvae is challenging because of the various types of beetle species and many places they develop, but several factors can aid in the process. Most beetle larvae are less than an inch long, but some can be larger depending on species and stage of growth. The majority of beetle larvae have soft, pointed bodies, resembling caterpillars. When discovered, the larvae usually are lying on their sides in a C-shaped position. They often are dirty white with a brownish head. Beetle larvae, commonly called grubs or white grubs, have six well-developed legs, with the exception of the June beetle, which does not have fully developed legs as a grub. By comparison other types of insect larvae have fewer legs and many, such as housefly larvae, do not have heads. Beetle larvae can be found in many places, but common areas to find them include leaves, wood, seeds, nuts and moist soil. For example, bark beetles and powderpost beetles live within bark and inside trees. June beetle grubs are buried up to five inches below the ground. Beetle larvae also are frequently known to live on plants, along lawns and near vegetation. By contrast, other larvae such as maggots and mosquitoes grubs live in stagnant water. Beetle grubs are commonly found in clusters. 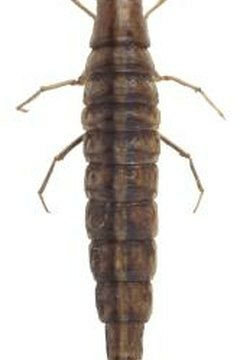 Beetle larvae are generally found in the late summer to early fall. This is because female beetles typically lay their eggs in the spring and early summer. The eggs hatch in a few days up to two weeks later. The beetles live as grubs for a few months, feeding on plant debris and growing stronger. By winter, the larvae have reached their peak and are ready to form cocoons. The cocoons protect the young beetles through the colder temperatures. Grubs do not return until the following summer. Sometimes, rather than by sight, it's easier to identify beetle grubs by the damage they leave behind. Beetle grubs are known to ravage lawns, trees and vegetation. Heavy infestations can eviscerate grass roots, causing the area to become spongy. The destruction allows the sod to be rolled back like a carpet. Evidence of beetle larvae include patches of dead or dying turf. Another indication of beetle grubs is the presence of moles, skunks or birds feeding on the spongy turf.